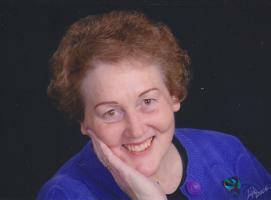 Carmen C. Russell, age 72, of Newark, passed away on Wednesday, April 3, 2019. She was born on June 6, 1946 to the late Clifford and Mavis (Harrison) Carter in Ypsilanti, Michigan. Carmen spent her life helping others. She was a social worker for almost 30 years and was an active member of First United Methodist Church. Carmen was the co-coordinator for bereavement luncheons and a Stephen Ministry Leader. In her free time, she enjoyed weaving, playing various musical instruments, including the flute, piano, and hammered dulcimer, and flying with her husband. Carmen is survived by her loving husband of 29 years, Christopher Russell. She also leaves behind her children, Stephanie (Douglas) Miller, Leslie (David) Hawy, and Christopher (Paula) Slagle; step-children, Dianne (Robert) Renzulli and Sasha (L. Tracy) Russell Baca; grandchildren, Mykal Hawy, Jakob Miller, Madison Miller, Garin Slagle, Raiden Renzulli, Skye Baca, and Grace Baca; siblings, Cherie Carter and Gary Carter; and former husband, Stephen Slagle. A memorial service will be held at 10:30am on Monday, April 8, 2019 at First United Methodist Church, 88 N. 5th Street, Newark, OH. Family will greet friends from 2-5pm on Sunday, April 7, 2019 at Brucker Kishler Funeral Home, 985 N. 21st Street, Newark, OH 43055. In lieu of flowers, donations may be made to Hospice of Central Ohio, PO Box 430 Newark, OH 43058.